I am directed to refer to this Ministry's letter No. 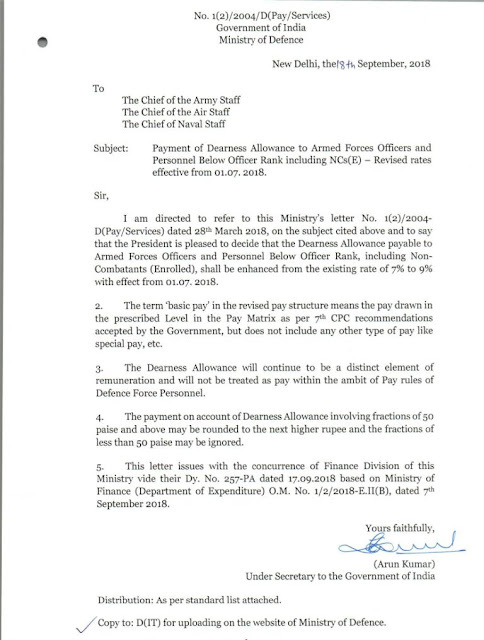 1(2)/2004- D(Pay/Services) dated 28th March 2018, on the subject cited above and to say that the President is pleased to decide that the Dearness Allowance payable to Armed Forces Officers and Personnel Below Officer Rank, including Non-Combatants (Enrolled), shall be enhanced from the existing rate of 7% to 9% with effect from 01.07. 2018.